Cairn Terrier Dogs - The Cairn Terrier is a small breed of dog in the terrier category. It is one of the oldest terriers, originating in the Scottish Highlands and recognised as one of Scotland's earliest working dogs, used for hunting burrowing prey among the cairns. The Cairn Terrier has a harsh, weather-resistant outer coat that can be cream, wheaten, red, sandy, gray, or brindled in any of these colors. Cairn Terriers are intelligent, strong, and loyal. Like most terriers, they are stubborn and strong-willed, and love to dig after real or imagined prey. Cairn Terriers have a strong prey instinct and will need comprehensive training. However, they are highly intelligent and, although very willful, can be trained. Although it is often said that they are disobedient, this is not the case provided correct training is applied. These are working dogs and are still used as such in parts of Scotland. Some Cairn Terriers are very independent and do not make good "lap dogs". The image of Cairn Terriers being like "Toto" from the Wizard of Oz is a partial misconception. In reality, these dogs do not always like to snuggle and would heartily object to being kept in a basket. They like to do what they want, and will not make good pets for someone looking for a dog to cuddle with. However, they are extremely loyal, playful, and amiable. This information is licensed under the GNU Free Documentation License. It uses material from the Cairn Terrier article on Wikipedia.org. 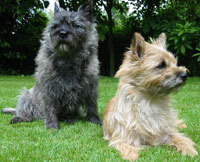 Cairn Terrier Breeders - Advertise your kennel puppies and dogs here.